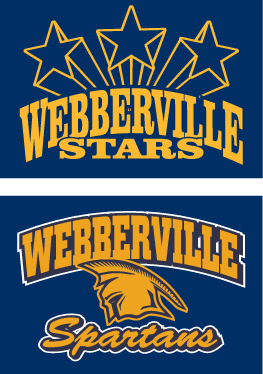 WEBBERVILLE ELEMENTARY and WEBBERVILLE SPARTANS apparel are now available to order online! This is a FUNDRAISER that will benefit the programs at Webberville Elementary School. This apparel offering includes items with a WEBBERVILLE ELEMENTARY STARS logo, and items with a WEBBERVILLE SPARTANS logo. Please choose your item carefully. ORDER DEADLINE IS FRIDAY, SEPTEMBER 28th. No orders will be accepted after the September 28th order deadline. All orders will be held until the order deadlines, then processed in bulk. Please allow approximately 2-3 weeks for delivery. You may CUSTOMIZE any of the shirts with name on shirt backs at an additional charge. To customize, make selection on the page of the item you are ordering. 1. "IN-STORE PICK UP" - when your order is ready, it will be delivered to the Webberville Elementary School office for pick up there. 2. "US MAIL" - when your order is ready it will be mailed US MAIL to the address on your order form. There is an additional charge for this option (cheapest of the home delivery options). 3. "UPS GROUND" - when your order is ready it will be shipped UPS GROUND SERVICE to the address on your order form. There is an additional charge for this option (most expensive of the home delivery options). Please select your size carefully. All orders are custom made to order and may not be returned for size exchange or refund. There is a size chart on the description page of each item. Please be sure to check that size chart before ordering. NOTE: we will have some items (but not all) at our store in Fowlerville. If you would like to see or try on items, please feel free to stop into our store.